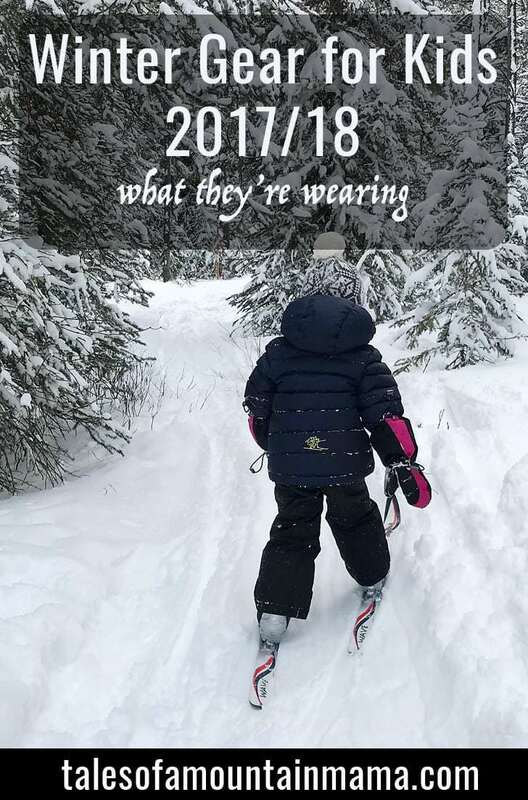 You are here: Home / Gear and Reviews / Winter Gear for Kids 2017/18 – What They’re Wearing! 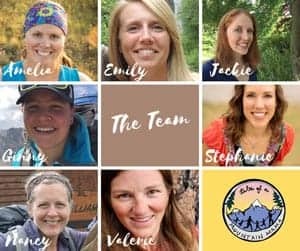 Every year I like to pull together a round-up of the gear we are using and our thoughts on it. 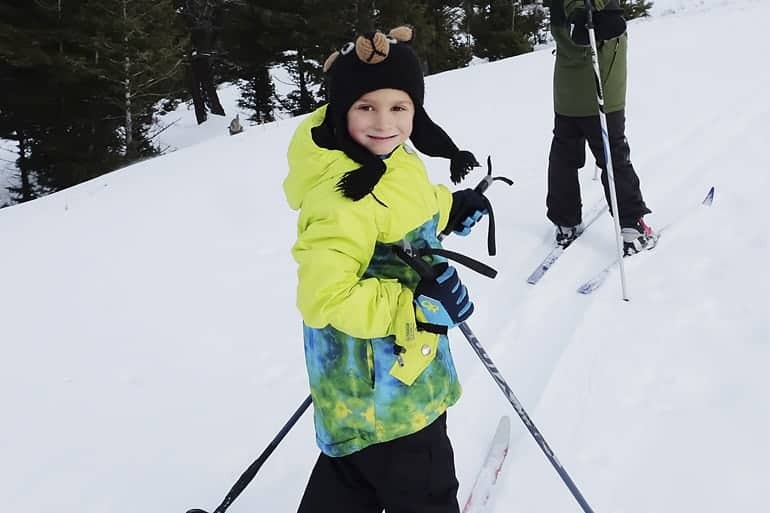 Winter gear for kids is so tough sometimes – it really is essential to have quality gear for happy kids and happy adventures. This year we are testing a really huge range of gear. As always, I’ll come back and edit this post as the season progresses. Save it, refer to it, and come back to it as needed! While this post does include wet-weather gear, I have to include a note that the majority of our winter time is dry and coldish. So that is what we know best! Big thanks to the following brands for trusting us for testing this winter: Oaki, Stonz, Helly Hanson, DucKsday, Muck, Kinco, Columbia, KEEN, Tobe, Obermeyer & Veyo! Wee Woollies: These are a lighter weight wool, but ideal for most conditions and super soft on the skin. 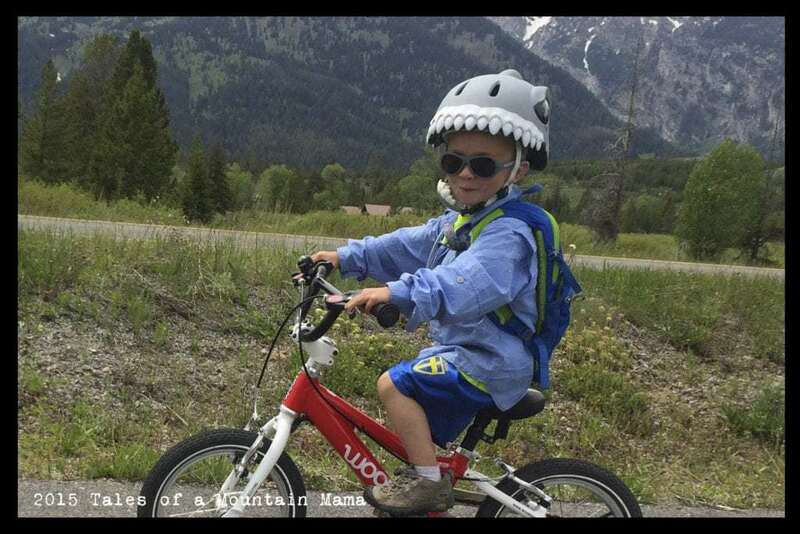 Our kids wear them for base layers and pajamas too. In fact, sometimes we will go days before I realize they haven’t changed them – whoops! Oh and they can be thrown in the washer AND dryer with no issues – laundry queen score! Ella’s Wool: These base layers are slightly thicker than Wee Woollies, but also very soft. I especially love their baby hat – perfect for a tighter fit that won’t pop off. Luvmother: This is a new brand to me, but we really are big fans. They have a full line of kid’s clothing too so you can wear wool as more than just base layers. Our Aha Merino Hoody is great for layering in the fall/winter or on its own in the warmer months too. I’m planning on getting some more of their pieces – they’re darling and functional! Stripes: These are Poly-pro and awesome. They dry much quicker than wool (really almost instantly) and are soft too (though admittedly not as soft as the wool). I think they are slightly warmer too. See our full review here. 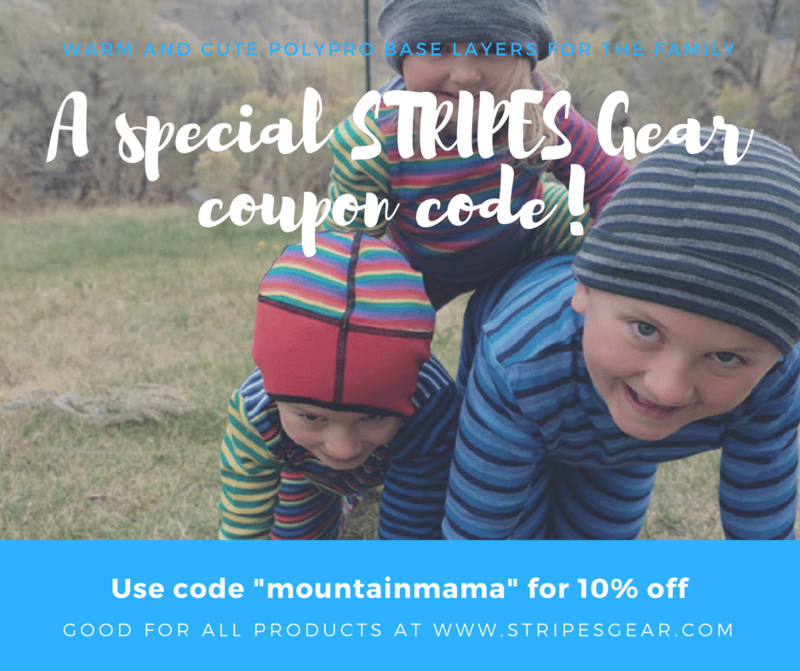 GO HERE and use code “mountainmama” for 10% off! 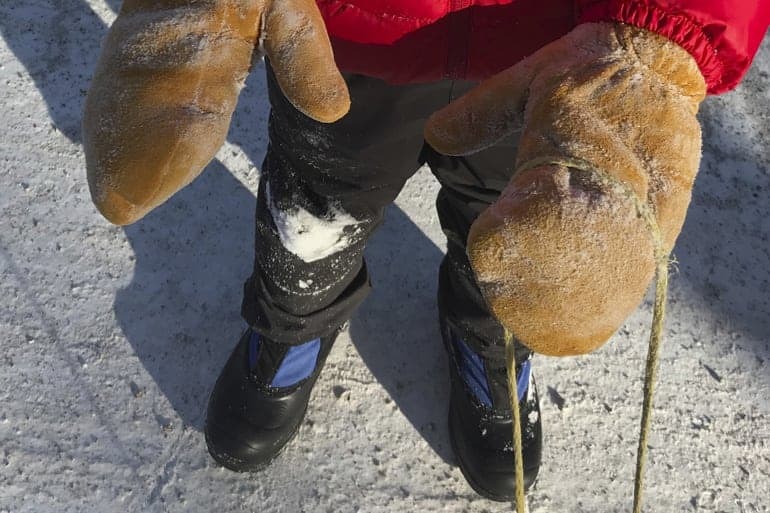 Polarn O Pyret: My kids are wearing these for the first time this winter and so far I’ve been very impressed. They’re very soft, keep their shape and come in baby baby – age 12. They have a few different wool styles from a very light pair (better for lifestyle) to some thicker pairs we use for skiing, winter hiking, etc. They also carry knee-highs and wool tights. I have never been disappointed with anything from Polarn O. Pyret and the socks are no exception. Farm to Feet: I love these socks for myself and think they are perfect for kids too. And the XS fits a preschooler (about a size toddler 6+). They hold up very very well! Available at Biddle & Bop. Geggamoja: This was recommended to me by Jess over at Biddle & Bop and we are trying them now. They come super tiny, which is perfect because the babies need warm feet too! Available at Biddle & Bop. 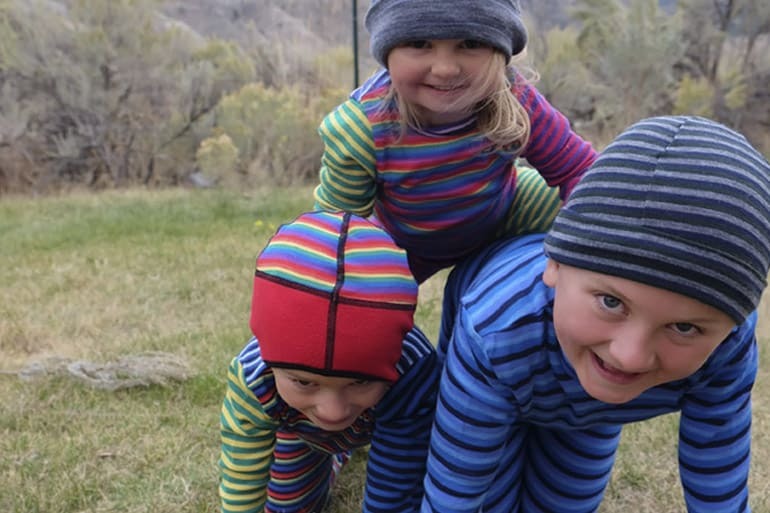 Molehill Mountain 4- Way Stretch: These have been the perfect mid layer for the kids this winter. I love that this small companies literally sews their gear in-house too. These are a bit of a looser fit so work best for us as a mid layer, but they can be worn next to skin too (and are super soft on the inside.) Their hoods are perfect for layering too. Ella’s Wool TUBES: Our favorite wool pants for layering. The kids usually wear them over Wee Woollies on super cold days. They roll up easily and are super soft and comfortable! I just wish they came in bigger than a size 8 kids! Obermeyer Ultragear Micro Zip Top: A lightweight fleece top that helps keep the core warm on cold days. The higher neck helps keep the cold out more too! 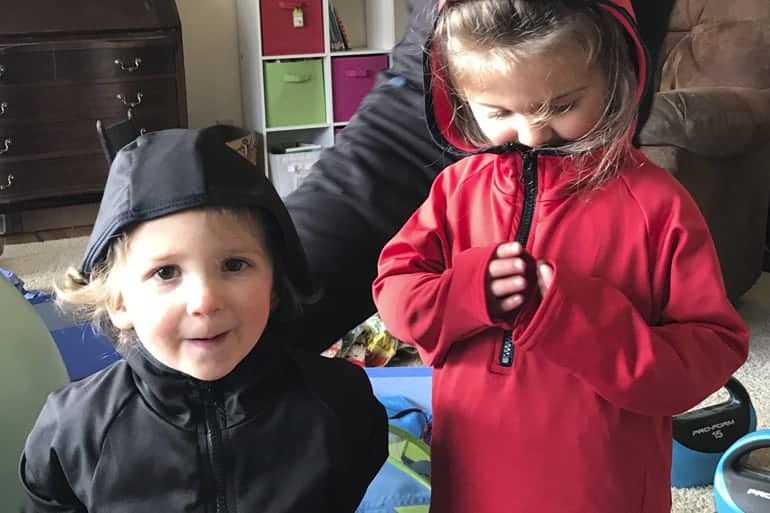 Helly Hanson K Shelter Jacket: For older kids or kids that run hot, this shell is great because it lets you layer however you need to under it. It’s also a great all-season jacket and works great for wet snow or torrential downpours. It breathes well, too, which makes all the difference. Finally the adjustable cuffs makes putting mittens/gloves on under it easier and is reflective for safety. Available in a ton of different colors. Helly Hanson K Snowfall INS Jacket: An insulated jacket with a bomber hood, great for the ski hill. This pairs well with their Snowfall INS pant. A place to put your ski pass, great pockets for hauling snacks and reflective for safety. We also love that the bright patches mean we can find him easily, but the rest of the jacket is a neutral color making it not quite as obnoxious off the hill. Columbia Alpine Action II Jacket: Columbia continues to not disappoint with their ski gear. This jacket is long enough to keep the snow out, especially coupled with the interior powder skirt. I do believe the Omni-Heat reflective dots work and this jacket is another proof of that – J is never cold. This style available for toddlers, girls and men too! Molehill Mountain Down Hooded Jacket: This jacket is one you could sleep in and be super cozy. In fact, I know some people that do (even better? Their down buntings as sleeping bags for wiggly kids!) The hood fits tight and well and it’s puffy and warm. Downsides? No zippers on the pockets and a shorter length means it doesn’t work as well as an outer layer. Therm Snowrider Jacket: This is a new jacket to the snow scene – the company is based out of New Zealand (but you can buy them via Amazon in the states). They’re fantastic for keeping kids warm and dry. We love that it is not super puffy or stiff and allows for great movement for kids. It’s also fully fleece-lined for soft comfort! Helly Hanson Shelter Pants: These are a great year-round pant because they are fully lined and waterproof and still of a medium weight. 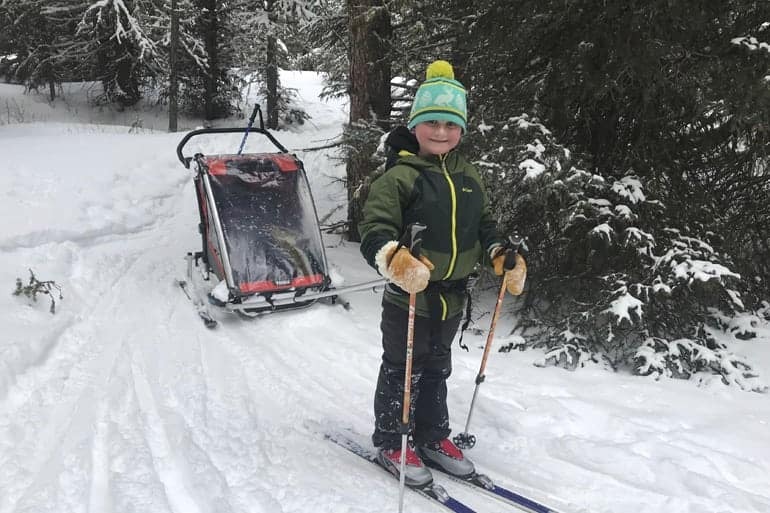 J wears his while skate skiing or hiking when he doesn’t want bulkier snow pants. Work for snow (layered underneath) or rain! Helly Hanson Snowfall INS Pants: These pair perfectly with the above-mentioned Snowfall INS jacket. While I do love bibs for my kids, we have had no complaints about these at all. 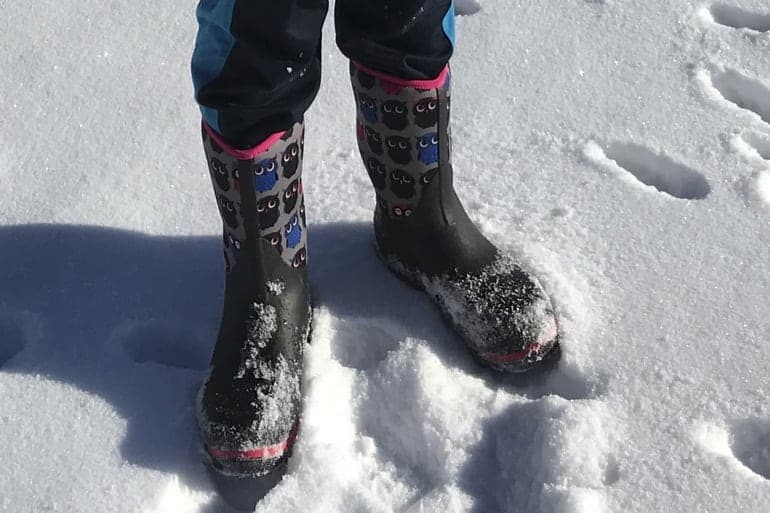 They fit over ski boots great and have a durable rubber adjustable stirrup strap to keep them in place, especially when they’re out playing in the snow. Like the jacket, they are reflective for safety. Obermeyer Volt Pant: We have had a pair of Volt pants for a couple years now and they show no wear at all. They are super durable, fit over ski boots very well and are warm without being bulky. Adjustmentable straps and waist for a great fit. It has Obermeyer’s “I grow” system which gives you an additional 2″ on the length when needed. Only downside is they do not have shoulder strap releases, which would make bathroom breaks easier. Snow Dragon: The best budget-friendly snow pants. You can usually find these at Sierra Trading post for under $30. They are warm with a fleece bib, have velcro for easy on and off without having to take off the jacket and do well for a season or two. We find after that they aren’t as waterproof, but great playground pants. Columbia Snowslope Bibs: These are a great basic bib that allows for growth by adjusting the seams (using their “Outgrown Grow System”) and the straps. It’s warm, durable and can easily be passed down to a few kids. Only downside? The shoulder straps don’t release which means for outdoor potty breaks, a lot more layers have to come off. 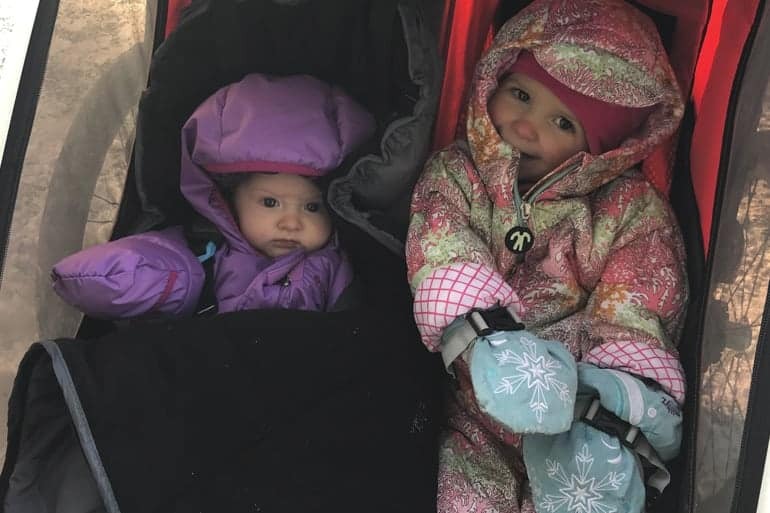 Therm Convertible Snow Pants/Bibs: These are wind and waterproof and, like the Therm jacket (see above), allow for great movement and dry kids. The bibs are removable both by a zip in the back and a front release on the straps. My 6 year old can convert them easily and likes wearing them because they are easy on and off! 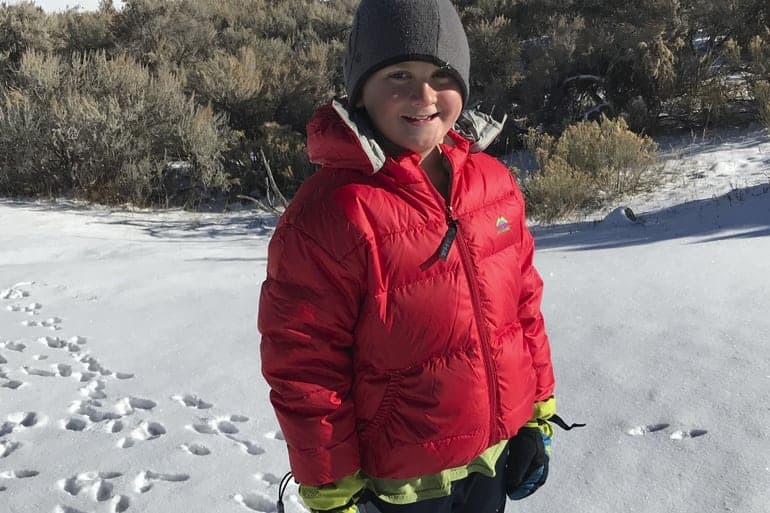 TOBE Suit Edus Insulated: This is THE warmest and THE most durable suit for kids we have seen. It’s what we grab for long outdoor days in cold temperatures. TOBE makes suits for snowmobiling too, so they know cold. Only downside? The fleece interior makes it heavy and if my kids know they will be XC skiing or hiking, they opt for something else. I also wish it had an adjustable waist to keep it in place when kids are growing into it. TOBE Ludo Suit Non-Insulated: For an outer layer to keep out the elements, this suit is bomb-proof. It has room for layering, excellent zippers, a great hood and is light. Only issue? I wish there was a waist cinch to get a better fit, just like I mentioned for the Edus. Note: TOBE does make some more budget-friendly suits. While we have not tried them, I trust the brand enough to recommend anything they make! 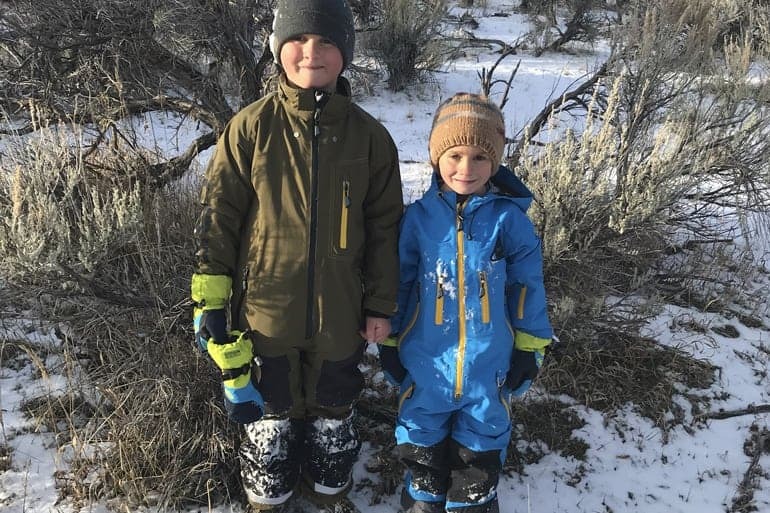 DucKsday Snow Suit: My kids have worn DucKsday for years and years now and the Toddler/K is a new style that Ollie and Stella (the USA retailer) is carrying. It’s warm without being bulky, has reinforced bum and knees and a great hood for extra coverage if needed. I also love that it has stirrups to keep it down over boots. As far as snowsuits are concerned, this one is very lightweight (but warm) and all DucKsday suits have really great hoods. 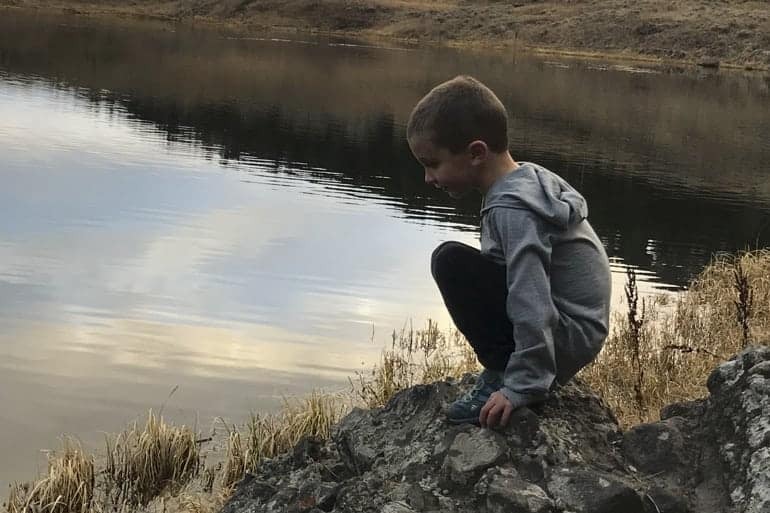 Molehill Mountain Cozy Bunting Suit: This is a perfect for kids that need warmth when you don’t need to worry about them staying dry (it’s not super water proof, though water resistant). It’s fleece lined and has fold over hand and foot cuffs. In fact, the arms are a little on the long side to allow for tucking those hands in! My only gripe is the zipper doesn’t go all the way down a leg so getting them in is a little harder…. Columbia Snuggly Bunny Down Bunting: We had a different version of this for J 8 years ago, and this one is even better. The hood stays on well, but allows for baby movement and it’s completely fleece-lined on the head and torso for happy babies! Plus, I love that it zips completely down a leg for easy in and out. Muck: For neoprene boots, I have come to trust Muck first and foremost. The Hale is a favorite for year-round play with a comfort rating from sub-zero up to 65 degrees F (4 mm neoprene). But for my son with bigger heels, the Element is a much easier on and off boot and is a bit warmer (5 mm neoprene – comfort rated -20 – 50 degrees F). We also have found the Element has slightly better traction. Stonz: While there are a ton of fantastic boots for kids out there, we have had the best luck with Stonz Trek Winter bootz (for sizes toddler 10 – Youth 6). They are super lightweight and incredibly warm (comfort tested by the company to -58 degrees F, by us to -25 degrees F). Only downfall is that after about 3 seasons, the soles are slightly worn down and don’t have as good of traction. That said, the kids have never complained about them. Note: Stonz also carries the “Scout” boot for smaller kids. It is a good boot, but the opening allows snow in more than I like and my daughters tend to slip in them more than the boys do in the Trek. Oaki Boots: Oaki now has a full line of winter boots with three different styles – neoprene, velcro close and toggle close. 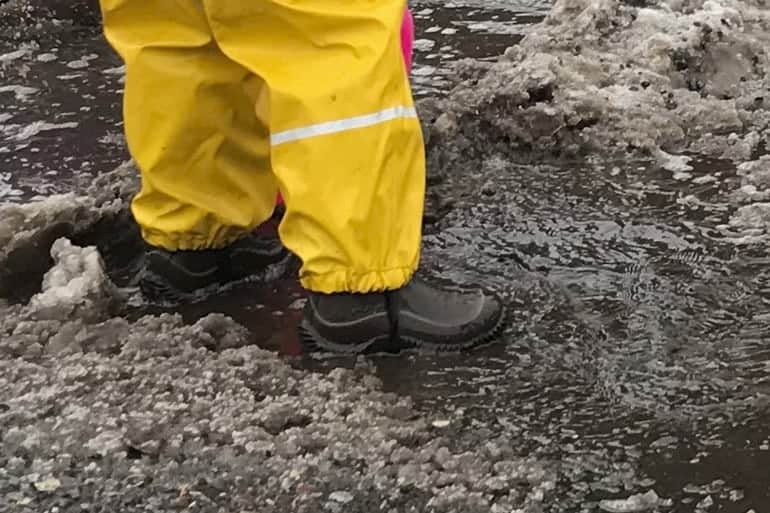 In our opinion, the Toggle are the warmest, the Velcro are a great on and off boot and the Neoprene does very well for the price-point in rain or snow. You’ll notice that Oaki is very budget-friendly and they are growing quickly and adding new designs and styles often. Pediped Grip N Go Rosa Insulated Shoes: When it’s not super cold out or we don’t plan to be out for a very long time in deep snow, I put these on our 18 month old. They have very flexible soles, are easy to walk in and keep her warm (especially coupled with wool socks). Baby Bogs: For new walkers, I have found the Baby Bogs to be the warmest (I always use a thick wool sock with them) and easiest to put on and walk in. 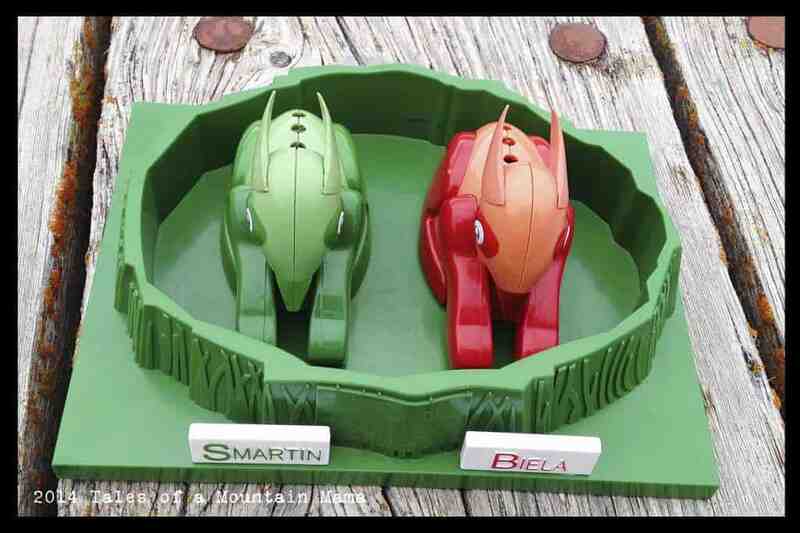 Kinco: Mtn Papa has been fans of Kinco for years and years now for himself, but this year we are getting to try out their kid’s collection. The gloves/mittens range from lightweight work gloves to fully insulated mittens. J (aged 8) says these ones are the warmest he owns (though the leather does get stiff in the cold/wet). They are great for skiing, working or just playing. Our boys love these for shoveling the driveway. Plus, they’re cheap and you’re not heartbroken if they get lost! Veyo Mittyz: Our top pick for toddlers. They are thumbless, but with a shape that allows for hand movement. We also love that they are soft on the outside which makes them more pliable in the cold too! Plus, the designs are super cute! What are your kids wearing this winter? Questions about how to keep warm? Feel free to leave us comments! 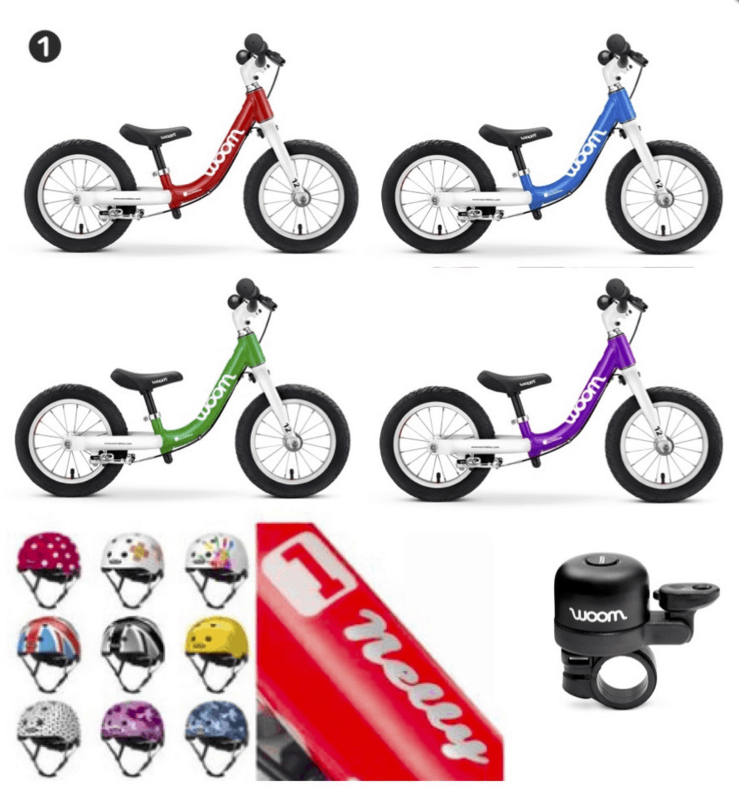 Celebrating Bike Month with a WOOM Giveaway! thank you sooo much! We haven’t been skiing with our little ones yet, but we did camping in Scotland in summer (that means som 6-10 degrees at night). For base layer we used Brubeck Extreme Merino Junior, which fitted even our then-one-year-old daughter. 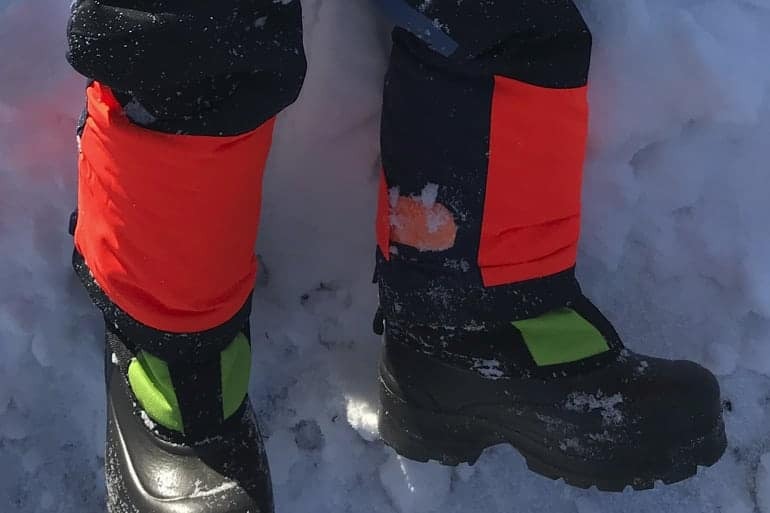 As for winter boots, I can also recommend a Polish company Bartek – they make proper snow boots, with woolen inside, goretex outside, tested by us for over 3 years now 😉 I don’t know if they ship to the US, but certainly to other European countries. Thank you for this line-up! Do you have any recommendations for toddler hats? Our little one prefers to not have them tied on. Baklava and beanies are probably best! Do you include a base layer and mid layer beneath the K Shelter pants/jacket? I’m trying to figure out layering…Snow pants beneath? Or no? Newly here. Thanks! Hi Rachel – so sorry for my delay. So it totally depends on the weather! If it’s really cold out then yes! I wouldn’t do snow pants because extra bulk but a base layer + fleece or puffy jacket/pants 🙂 Hope that helps! And welcome! 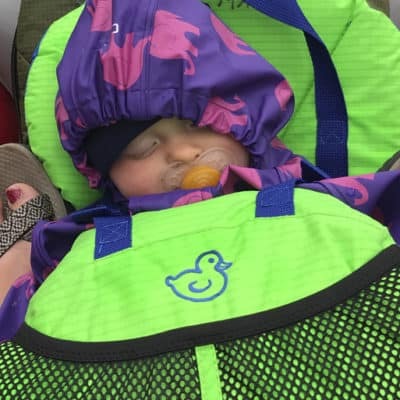 What’s your favorite gear for keeping a baby warm in a bike trailer??? Hi Carrie 🙂 I always use snowsuit + bunting! 🙂 And you???? Well we don’t live in the snow so we don’t own snowsuits! But it gets cold enough (20 degrees, don’t laugh) that I do worry about the baby getting too cold. I guess bunting by itself then? You use a snow suit and bunting at the same time??? Wow, I’m not made for that kind of cold. HAHAHA. Hi There, Thanks for this review. I loved seeing various products I didn’t even know existed! We live in Toronto so we have a few very cold days but most of the winter isn’t too bad. My 5yr old son HATES his snowpants with a passion. He really dislikes anything that is bulky around his calves/ankles–he only likes tapered pants, no wide leg jeans or even track pants with elastic bottoms. I told him that next winter we would try to find him a less bulky pair of snowpants that he can wear at recess, walking back and forth to school, and for skating lessons. Do you have any suggestions of brands to look at? Looking around our local sports and outdoor stores, I don’t seem to see much that would fit his criteria. There are several that seem very lightweight but they are all very wide around the bottom. We don’t need super warm, but something warmer than splash pants. He would like something that can fit inside his boot rather than over top (not ideal for deep snow, I know, but that’s not usually too much of an issue here most days). Any suggestions would be much appreciated. Thanks! I would try the Jan & Jul fleece lined pants! My son doesn’t like bulky ones either and these seem to do the trick….and cinch at the ankle cuff!